For the village located within this town, see Goshen (village), New York. Goshen is a town in Orange County, New York, United States. The population was 14,038 at the 2017 census. The town is named after the Land of Goshen. The Town of Goshen contains a village also called Goshen, the county seat of Orange County. The town is centrally located in the county. Settlement began around 1714, even though plans for its settlement were made around 1654. The town was established in 1789. In 1830, part of Goshen was used to form the new Town of Hamptonburgh, and, in 1845, another part was used to form the Town of Chester. When the French and Indian War began in 1756 the men of Goshen were continually under arms. The old Journal of the Assembly relates the services of Captain George DeKay as an express between Goshen and Minisink. It mentions as his guards Peter Carter, David Benjamin, Philip Reid and Francis Armstrong. It tells also of the payment of nearly too pounds to Colonel Vincent Mathews for furnishing guides to regulars posted at Goshen from October, 1757, to February, 1758, and refers to the work of Colonels Clinton and DeKay in laying out block houses for the settlers' defense. Mention is also made of the payment of 56 pounds to Samuel Gale for provisions furnished troops on the frontiers near Goshen; and of reimbursing Colonel Benj. Tusten, Captain Daniel Case and Captain J. Bull for money advanced in building block houses Nos. t and 2 on the western frontier in January, 1757. In 1763, Lieutenant Governor Cadwallader Golden appealed to the General Assembly for troops to relieve the militia on the borders of Orange and Ulster which were infested by the enemy. At this time the town of Goshen extended from the Hudson to New Jersey. In 1764 a bill was passed dividing the precinct of Goshen into two precincts, to be called Goshen and Cornwall. After this division Cornwall embraced the present towns of Cornwall, Monroe and Blooming Grove, while Goshen included the present town of Warwick. During the years prior to the Revolution when the colonists were growing desperate under the exactions of King George, patriotism and valor were manifested to a marked degree in Goshen. On June 8, 1775, over 360 men signed the Revolutionary pledge at Goshen and the name of Henry Wisner headed the list. The Reverend Nathan Ker, an ardent patriot, and the fourth pastor of the Goshen Presbyterian Church, who came to Goshen in the fall of 1766, and remained until his death, December 14, 1804, on one occasion is said to have dismissed his congregation in the midst of a Sunday service to prepare food for a troop of horse that had halted on the way to Philadelphia. Once General George Washington, riding eastward on the Florida road towards his headquarters at Newburgh, stopped with his staff to chat awhile with the children at the old school house near the stone quarry. On July 22, 1779, occurred the battle of Minisink, in which the Goshen regiment, under Colonel Tusten, met almost complete annihilation at the hands of nearly 500 Indians and Tories under Joseph Brant, the half breed chieftain, who was known as Thayendanegea, the Scourge, and held a colonel's commission from George III. The Goshen regiment marched against Brant's forces to avenge a raid made by Brant upon the settlers near Minisink on the 20th of the month. They were joined by a small reinforcement, under Colonel Hathorn, of the Warwick regiment, and the latter assumed command. While marching along the west bank of the Delaware at nine o'clock on the morning of July 22, the Indians were discovered about three quarters of a mile away and Colonel Hathorn hastened his command in pursuit. Brant, taking advantage of intervening woods and hills made a detour which enabled him to gain the rear of the attacking party, and in the battle which followed the savages completely routed the small force that opposed them. The colonists had little ammunition and this was soon exhausted. A part of them fled, and more were killed in flight than in battle. Colonel Tusten, who was a skilful surgeon, dressed the wounds of his men, and refused to abandon them, staying on the field until he fell. Of the eighty men in the engagement, 44 were killed outright and others died later of their wounds. Colonel Benjamin Tusten, who was a physician and surgeon by profession, came originally from Southold, L. I., in 1746, at the age of three years. His parents located on the banks of the Otterkill on the patent granted to Elizabeth Denn. His father, Benjamin Tusten, was appointed one of the judges of the courts of the county and also a colonel in the Orange County regiment of militia. The son, Benjamin, was sent to an academy at Jamaica, L. I., and at the age of nineteen returned to Goshen and studied medicine with Doctor Thomas Wiskham. He afterwards studied in Newark, N. J., and New York City, returning in 1769 to practice medicine in Goshen, where two other physicians, Doctor John Gale and Doctor Pierson, had already located. He was very successful and was widely known as a surgeon. He married Miss Brown, by whom he had two sons and three daughters. In 1777 he was appointed lieutenant colonel of the Goshen regiment of militia under General Allison, and in 1778 was appointed surrogate of Orange County, which office he held when he lost his life at Minisink. Captain John Wood, of Colonel Tusten's regiment, was captured in the battle of Minisink, his life being spared by Brant, who in the thick of the battle, thought he saw Wood give a masonic sign. Wood was taken captive and transported to Canada. He left a journal of events following the battle which throws considerable light on the life and character of Brant. On July 22, 1822, by the influence of Dr. David R Bernell, of Goshen, a monument was erected in the village to the memory of the men who fell at Minisink. It was set up over the bones of the patriots which had been gathered from the battlefield forty three years after the massacre. On July 22. 1862, a more pretentious monument was dedicated and unveiled, provision for the cost of the same having been made in the will of Dr. Merritt H. Cash, of Minisink. Goshen's towering First Presbyterian Church was constructed in 1720. The church's steeple towers over the colonial era town and is over 8 stories tall. As late as 1890, the church continued to be the tallest structure in the county, visible from miles away. The church connects to a series of underground tunnels that used to the connect the town before they fell into disrepair. The tree located in the yard just outside the church was used for public hangings in the colonial era. A drone video of the church can be seen here: https://www.youtube.com/watch?time_continue=307&v=lta0TM4ZqAw. The town also has a series of mysterious tunnels that run beneath it. They connect Goshen to many other prominent colonial towns that are many miles away. People are unsure of what their use was and who built them. The region was important in the development of harness racing. Goshen has the oldest harness racing track in the world, it has been in operation for over 178 years. On June 24, 1873 President Ulysses S. Grant was a guest in this house and watched the trotters race over historical track from barn in the rear. The courthouse in Goshen was constructed in 1841 and reflects the Greek Revival in architecture that produced many fine buildings and is prevalent throughout the town. Goshen is the birthplace of the former Army Chief of Staff, and former Chairman of the Joint Chiefs of Staff, General Martin Dempsey. Goshen was home to Camp Wickham which was raised in Goshen in the summer of 1862 the 124th Regiment of Volunteers was muster into federal service in Goshen on September 5, 1862 and mustered out at Washington's Headquarters in Newburgh, N. Y. on June 14, 1865. The soldiers fought in the Appomattox Campaign, and were present during the Confederate surrender at the Battle of Appomattox Courthouse. In 2007, Michael Kohn, a Goshen Volunteer firefighter, started the fire that destroyed a house at 113 Webster Ave. Kohn pleaded guilty to arson and was sentenced to five to fifteen years in prison. In 2014, Devin Giordano and Jennifer Molyneaux murdered Helen Mills in her Goshen home. The pair pleaded guilty to second-degree murder in 2015.
in 2018, Lego announced plans to open a Legoland theme park in 2020 in Goshen. According to the United States Census Bureau, the town has a total area of 44.0 square miles (113.9 km²), of which, 43.8 square miles (113.6 km²) of it is land and 0.1 square miles (0.3 km²) of it (0.27%) is water. As of the Census of 2010, there were 12,913 people, 4,074 households, and 2,912 families residing in the town. The population density was 313.6 people per square mile (113.7/km²). There were 4,320 housing units at an average density of 98.5 per square mile (38.0/km²). The racial makeup of the town was 81.6% White, 6.6% Black or African American, 0.16% Native American, 4.5% Asian, 0.04% Pacific Islander, 1.82% from other races, and 3.3% from two or more races. Hispanic or Latino of any race were 12.9% of the population. Goshen is also home to a Yiddish speaking community, which operates several farms in the area. There were 4,074 households out of which 35.4% had children under the age of 18 living with them, 60.2% were married couples living together, 8.1% had a female householder with no husband present, and 28.5% were non-families. 24.4% of all households were made up of individuals, and 11.9% had someone living alone who was 65 years of age or older. The average household size was 2.73 and the average family size was 3.27. In the town, the population was spread out with 21.4% under the age of 18, 7.2% from 18 to 24, 28.5% from 25 to 44, 23.0% from 45 to 64, and 16.9% who were 65 years of age or older. The median age was 39 years. The gender makeup of the town was relatively equal, as for every 100 females, there were 100.4 males, and for every 100 females age 18 and over, there were 96.9 males. The median income for a household in the town was $60,066, and the median income for a family was $71,497. Males had a median income of $50,768 versus $32,648 for females. The per capita income for the town was $24,275. About 2.7% of families and 4.5% of the population were below the poverty line, including 3.1% of those under age 18 and 8.8% of those age 65 or over. Big Island – A location near the south town line. Durlandville – A hamlet on County Road 6 in the southwest part of the town. Finnegans Corner – A hamlet north of Florida on NY-17A. Florida – A small part of the Village of Florida is on the south town line, located in route NY-17A. Goshen – The Village of Goshen is the county seat. 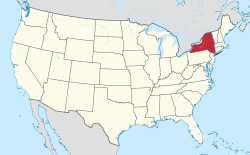 It is located in the northern part of the town north of conjoined NY-17 and US-6. Goshen Hills – A location east of Finnegans Corner. Howells – A hamlet south of Goshen village on NY-17A. Maple Island – A location south of Durlandville. Otter Kill – A hamlet southeast of Goshen village on NY-17. Pellets Island – A community on County Road 37 near the west town line. ^ Gannett, Henry (1905). The Origin of Certain Place Names in the United States. Govt. Print. Off. p. 140. Wikimedia Commons has media related to Town of Goshen, New York. This page was last edited on 13 March 2019, at 12:23 (UTC).